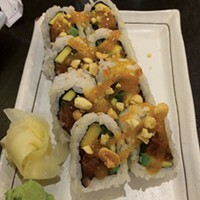 When you think Asian cuisine in Salt Lake City, think Kobe Japanese Restaurant in Millcreek. Sushi, sashimi, rolls, and nigiri on Salt Lake City's East Bench. There's an early bird special from 5-6 Mon-Wed, and "Japanese Night" on Thursdays. Wine, beer, sake, and green tea are available to sip. Try the green tea or red bean Mochi ice cream for dessert.